I have been sleeping in class, I admit it. I was attracted by the idea of blogging from the start, but it wasn’t until recently that I realized its true revolutionary potential. It is now clear to me that blogging (like Topic Maps and subject-centric computing) is going to change the world, and I want to be part of it. What convinced me was (1) meeting David Weinberger at the Topic Maps conference in Oslo a couple of weeks ago, and then (2) experiencing first-hand the power of blogging to spread news of theprotest about the Norwegian vote and the demo against OOXML on the streets of Oslo. I see now that blogging is part of the struggle to reclaim the right to freedom of expression, a right that the monopolization of the media over the last few decades has all but destroyed. It’s about ordinary people making their voices heard and starting to take control of their own lives; it is an act of self-emancipation. What I like about blogging is its democratic nature, the way it allows us to bypass those who think they are in charge and think they have the right to decide what gets published. But we shouldn’t forget that most of the world’s population as yet is unable to blog. Either they don’t have access to the internet, cannot read and write, or, more likely, have to spend all day simply trying to survive. That’s one of the things we have to change. We also should not forget that writing on its own will never change anything. The only thing philosophers get, as Tony Cliff used to say, is piles! If we really want to change the world, we have to get up off our backsides and join battle. David Weinberger was quoted recently in a Norwegian newspaper as saying that the Internet will make Obama president. I hope he is right. But if it does, there will come a time when bloggers and others will have to take to the streets in order to show the full extent of their support. My choice of title, Topic Maps And All That, is of course a tip of the hat to the Sellar and Yeatman book 1006 And All That. The subtitle is more than a tip of the hat to Steve Biko. Topic Maps (ISO 13250) is the standard around which my life has revolved for the last 10 years. Getting its name into the blog title is (yet another) way of promoting it, but the real significance is deeper. Topic Maps is fundamentally about how each and every one of us – as individuals, groups or organizations – can gain control of our own knowledge and harness it to achieve our goals (whatever they may be). From this perspective, everything has to do with Topic Maps, and Topic Maps has to do with everything – hence the “all that” of the title. I do not intend to write only about Topic Maps. On the contrary, of the 24 or so potential blog topics that I “brainstormed” on the flight to Frankfurt yesterday, only 5 or 6 have anything to do with Topic Maps. Some of the others are OOXML, subject-centric computing, Chomsky, tinnitus, Jenny Tauber (and her Nigerian namesake), the semantics of Bantu noun classes and Janáček. In short, Topic Maps – and all that – and more besides. This entry was posted in Revolution and tagged are_gulbrandsen, david_weinberger, steve_biko, subject-centric_computing, tony_cliff, topic_maps. Bookmark the permalink. We look forward to hearing from you, Steve! I truly agree on that. We have been talking of freedom of speech since Gutenberg but I think it is only now, with the blog tools, we can say that this has actually been achieved to a very great extent (there’s still a lot of people without computers or internet..). Kirill: I promise not to forget opera. (I assume you meant “Gluck” (http://en.wikipedia.org/wiki/Gluck), not “G’luck” 😉 He’s not my favourite, I must admit, but there is at least one exceedingly beautiful aria in Orfeo ed Euridice. Håkon: How could I forget Wagner? It’s far and away the best brand of frozen pizza currently available in Norway! However, I’m unlikely to say more about Wagner until I’ve at least mentioned Janáček. You do understand, don’t you? Svein: Yes, exactly, blogging is another quantum leap, but we should never forget that it’s still only available to a minority of the world’s population. I am currently developing a topic map-based knowledge management and repository application with Adobe Flex/AIR: http://www.quesucede.com/page/show/id/polishedcode. We introduced topic maps into the company I work for, and we’ve never looked back. I see the late Steve Biko, equally great man like Nelson Mandela. 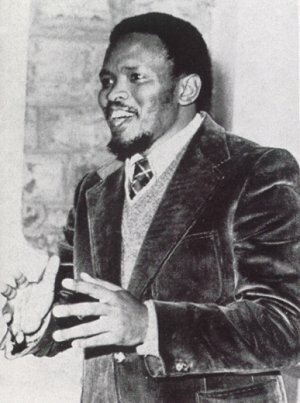 Even though he didn’t live to see the fall of Apartheid in South Africa, after all those efforts that cost him his life, his soul is happily rejoycing in his grave. Support South Africa’s appeal against OOXML!